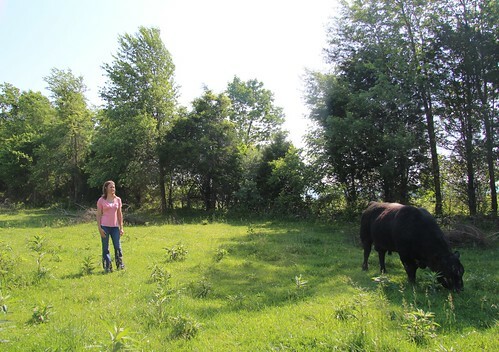 Cassie Munsey, 31, Monticello, Ky., checks in on the bull on her 14-acre beef cattle farm she purchased in 2013. As a new farmer, Munsey appreciates the increased flexibility in USDA programs allowing her to get her operation up and running. Farmers are unique in that they touch every single American every single day, because we all eat. Ensuring a continuity of agriculture is important to all of us. To take the pulse of U.S. agriculture, we conduct a Census of Agriculture every five years which gives us a comprehensive analysis of agriculture in America and supplements information from more than 400 other surveys we conduct each year. Our last census was in 2012, and the resulting data showed a decline in the number of new and beginning farmers compared to the previous census in 2007. On top of that decline, we saw the average age of American farmers trending upward to 58 years old. The USDA took these two pieces of information and recognized the need to encourage new and beginning farmers. One result of analyzing the data and understanding the need to promote new and beginning farmers can be seen in the 2014 Farm Bill. Among other things, it increased the flexibility for USDA Farm Service Agency (FSA) to offer financial assistance programs to new farmers. Amanda Robertson, one of FSA’s new beginning farmer regional coordinators works in Kentucky and Tennessee. She informs new and beginning farmers that the bill allows for broader application of disaster relief, disaster assistance, commodity insurance, farm start-up loans and agriculture-based loans, such as cattle loans to help them with start-up costs. All of these programs have foundations in NASS surveys. We conduct more than 400 surveys annually, in addition to the Census of Agriculture every five years, and every response matters to make sure reliable data are available to administer the programs Amanda mentioned and many others. Long-time experts in the field know how important our data is, too. NASS employees and our National Association for State Departments of Agriculture enumerators work hard to get timely, accurate and useful data that gives a realistic view of agriculture in America. These surveys ultimately help our farmers in a variety of ways, whether it’s through new and beginning farmer programs, FSA farm payments, crop insurance or agricultural production statistics. We at USDA NASS are working together with producers to keep agriculture in America growing. This come as a shock to whom? Tyson Foods slaughters 350,000 CAFO pigs per week and destroys the environment. I only want to be able to slaughter 5 pasture raised GMO Free pigs per week. And I cannot. Tell me again how the USDA supports the small farmer/producer? How can a small operation get their product to market? They cannot. Our local USDA office gives us a blank stare when my wife and I ask about veteran/minority owned farm programs. "We don't have those.". Which me know is untrue. Yet, no assistance comes from them. Perhaps if an USDA employee could be fired for being inept something would change. How about a cohesive attempt to reach out to those that want to farm, that want to take that risk and change their lives and perhaps the lives of others. People who want to provide clean, healthy and nutritious foods to their neighbors and communities. Feel good blog posts are not the answer. We are right there with you, we have been trying to get our local county USDA/FSA agent to help us with our produce farm, he didn't even look at our business plan which we paid 2000.00 dollars for. He just said that we didn't meet the requirement of farming for the last 3 years out of 10. But if you are a new farmer starting out how are you suppose to get any help from them....We are going to go over his head and see if that gets us anywhere. We are also going thru the Agrability route and if denied we can get them thru ADA for being denied.